Michael Boulware Moore addresses students from Charleston County schools. 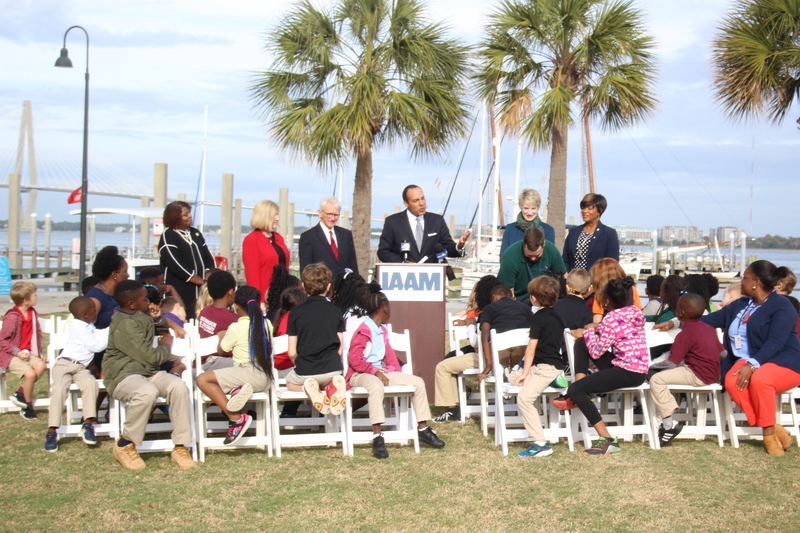 CHARLESTON, SC – (November 1, 2018) – Today the International African American Museum (IAAM) announced a $5 million donation from Rosalind and Jerry Richardson. Focused on education, the gift is the museum’s largest donation from individuals. The announcement was made today at a news conference attended by South Carolina Superintendent of Education Molly Spearman, Allendale County School District Superintendent Dr. Margaret Gilmore, Williamsburg County School District Superintendent Dr. Rose Wilder, Charleston County District Superintendent Dr. Gerrita Postlewait, and museum leadership, including IAAM President and CEO Michael Boulware Moore and former Charleston Mayor Joseph P. Riley, Jr., who also serves on the IAAM Board. The Richardsons’ donation includes a $3 million endowment to fund field trips for students who could not otherwise afford to visit the museum. The IAAM expects that more than 10,000 students from South Carolina, North Carolina and Georgia will annually have the opportunity to experience the museum first-hand, thanks to the Richardsons’ endowment. The Richardsons’ gift also provides $1 million for the construction of the museum and $1 million to support the development of the IAAM’s education curriculum, museum programs and outreach programs prior to its 2021 opening. Michael Boulware Moore noted that stories of ingenuity, perseverance and entrepreneurship will be presented throughout the museum’s curriculum and programs. “The museum promises to be an inspirational place that can increase the arc of young aspirations and instill confidence in a way that fosters success.Given Mr. Richardson’s experience in his life, it is fitting that a part of his gift will support the delivery of these stories and inspiration,” said Moore. Bids for the construction of the IAAM are being finalized and groundbreaking is expected within the next six months. Jerome Johnson Richardson, a lifelong resident of the Carolinas, has been a leader in the region’s sports, business and philanthropic development since the early 1960s. He is the only individual inducted into the sports and business Halls of Fame in both states. He was a Little All-American football player at Wofford College, and went on to play two seasons with the Baltimore Colts in the NFL. His 1959 Colts won the World Championship. In 1961, he opened his first Hardee’s franchise in Spartanburg SC, which grew to become a New York Stock Exchange listed company, Spartan Food Systems, only the third company in South Carolina to do so. After a series of mergers in the 1980s, he became chairman and chief executive officer of Flagstar Companies, Inc., relocating thousands of employees from around the country to its Spartanburg support center. On October 26,1993, he and his partners were awarded the 29th NFL franchise, The Carolina Panthers. The team began play in 1995 and went on to compete in two Super Bowls and three NFC championship games. He sold the team in July 2018. Richardson is a resident of Charlotte NC.